What types of cholesterol are? The word "cholesterol" comes from the Greek word chole, meaning "bile", and the Greek word stereos, meaning "solid, stiff". Cholesterol is “a waxy, fat-like substance”, chemical compound that is naturally produced by the body and is a combination of lipid (fat) and steroid. Our body needs it to make vitamin D and some hormones, build cell walls, and create bile salts that help you digest fat. About 80% of the body's cholesterol is produced by the liver, while the rest comes from food. Cholesterol, a type of lipid, is found in foods from animal sources. This means that meats, eggs, and whole-fat dairy products (cheese, milk, sour cream and ice cream) contain cholesterol — and vegetables, fruits, and grains contain none. Some foods that don’t contain animal products may contain trans fats, which cause your body to make more cholesterol. Foods with saturated fats also cause the body to make more cholesterol. The liver produces about 1,000 milligrams of cholesterol a day, and you probably consume about 150 to 250 milligrams in the foods you eat. Cholesterol and other fats can’t dissolve in the blood. They have to be transported to and from the cells by special carriers called lipoproteins. Low-density lipoprotein (or LDL) cholesterol is a bad type of cholesterol. tLDL carries cholesterol from the liver to cells. If too much is carried, too much for the cells to use, there can be a harmful buildup of LDL. 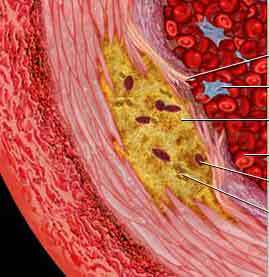 This lipoprotein can increase the risk of arterial disease if levels rise too high. Most human blood contains approximately 70% LDL - this may vary, depending on the person. High-density lipoprotein (or HDL) cholesterol is a good type of cholesterol. Doctors say HDL prevents arterial disease. HDL does the opposite of LDL - HDL takes the cholesterol away from the cells and back to the liver. In the liver it is either broken down or expelled from the body as waste. Triglycerides - these are the chemical forms in which most fat exists in the body, as well as in food. Triglycerides, in association with cholesterol, form the plasma lipids (blood fat). Triglycerides in plasma originate either from fats in our food, or are made in the body from other energy sources, such as carbohydrates. Calories we consume are converted into triglycerides and stored in fat cells. When your body needs energy and there is no food as an energy source, triglycerides will be released from fat cells and used as energy - hormones control this process. If is too much cholesterol in your blood, it builds up in the walls of your arteries, causing a process called atherosclerosis, a form of heart disease. The arteries become narrowed and blood flow to the heart muscle is slowed down or blocked.Much cholesterol in the blood is a major risk for coronary heart disease, which leads to heart attack. It’s also a risk factor for stroke. Hypercholesterolemia is the term for high levels of blood cholesterol.